On the farm, the Respirar Comunidad planning committee reviews progress. Photo by Maria Viacava. A group of Argentine families and their children who have learning disabilities have travelled across the world to learn vital lessons from a very special north-east community. The Respirar Comunidad Argentina organisation, which comprises seven families, is seeking to replicate the Camphill village model, where live-in volunteers work together in harmony with residents who have additional needs. Representatives from the group flew across the Atlantic to discover what life is like at Newton Dee, an acclaimed Camphill community in Aberdeen. During their stay, the South American visitors found out how Newton Dee provides individuals with opportunities to carry out meaningful work as bakers, farmers, woodworkers are more, and live independent lives. 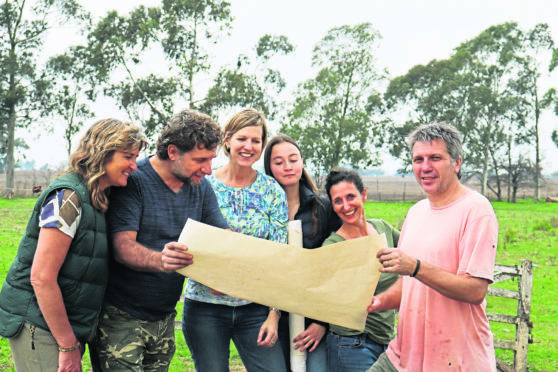 Rafaela Gunner, one of the members of the Respirar Comunidad Argentina group, said their time spent in Scotland will inspire them as they draw up plans for their very own agricultural community just north of Buenos Aires. She added: “We were very impressed and moved by the history of Newton Dee. What we found inspiring to see at work was how each person there puts their unique abilities at the service of the community. “Our idea is to create a community inspired by Camphill in Argentina, which will work with biodynamic agriculture and sustainable production to be largely self-sufficient. “It’s fair to say that, as a whole, Argentina is a developing nation and services are perhaps not of the same standard, variety and accessibility as in Europe or the US. “There is a heavy dependence on families, who bear the burden of care and many people and adults with special needs never get the opportunity to develop their potential and find their place in society as worthy individuals. She added: “We would like to be the flagship model for Camphill communities, serving as a beacon to all Latin American communities, in much the same way that we have looked to Newton Dee. “We’ve seen that the dream can become a reality and this has helped us to focus our energies. From her perspective, the message is simple. As she said: “We don’t have to reinvent the wheel, but we do want to develop something which is uniquely Argentine, inspired by the Camphill experience.